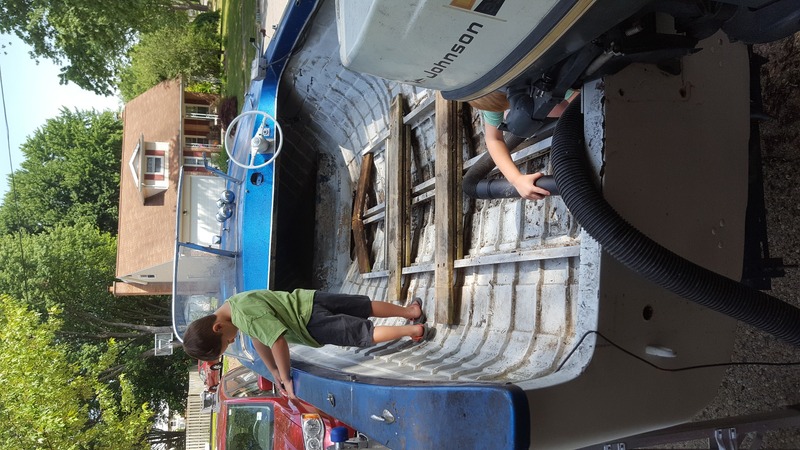 You are here: Home Forum Home MFG Owners Group New to boating - love this project boat! New to boating - love this project boat! TOPIC:	New to boating - love this project boat! Hello all, I come to the forums seeking advice and knowledge! 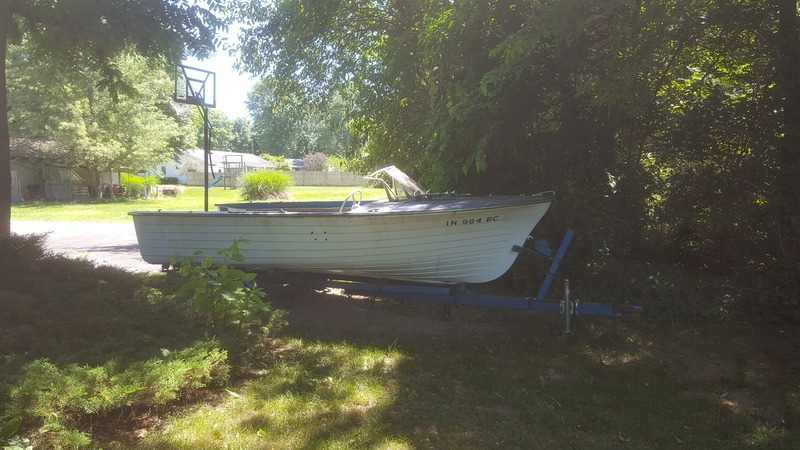 I picked up this boat almost 9 years ago, which (based on advice I got from this site at the time) I believe to be a 1961 MFG Edinboro Deluxe, although it looks very similar to a fee Westfields I've seen. I do have a serial number after some serious cleaning, but no way to use it for identification that I know of...yet! Anyway, I finally have a little time and money to put into it, although not a full restoration budget. I'm looking to get a good enough floor in with some budget seats so that I can take it out a few times and make sure it's worth a total restoration in a few years when Im finally ready to do it with my sons. Because the floor was already a soupy mess when I got this thing, I've very little idea what it originally would have looked like, and want to get it close. The boards in there now were to make walking around cleaning easier, but may end up staying to provide support for the floor. The aluminum framing inside must have had a VERY shallow bilge area, and I'm wondering if I leave the area below the splash well open, or try to put the floor high enough to go over the bilge pump. Also, was the drain at the bottom below the deck line, or did the floor originally scoop down to allow the water to run off deck and down and back? That seems less likely, but I saw a nice looking Westfield on YouTube with that set-up. I also need to replace the transom, as there is almost nothing left inside but ants.. It's currently holding a 1970 Johnson 33hp outboard, but definitely makes a "squish" if you try to move it around. The skins are in great shape, so i hate to rip one off to fiberglass new wood in place, plus there's the issue of the transom being curved slightly by design.. I'm not liking the cost of the sea cast, although all said and done that may be the best option. The floor I'm prepared to do again, with fiberglass and the whole nine yards, but the transom is rather important, and a "get it right the first time" deal! Any flights thoughts and advice would be greatly appreciated!! Sorry the first one was SO LONG. Thanks for posting the pictures and welcome aboard! You're looking at a pretty significant restoration project. MFG Edinboros from 1959-1961 had plywood floors, with a gasket running around the perimeter of the floor where is meets the hull. 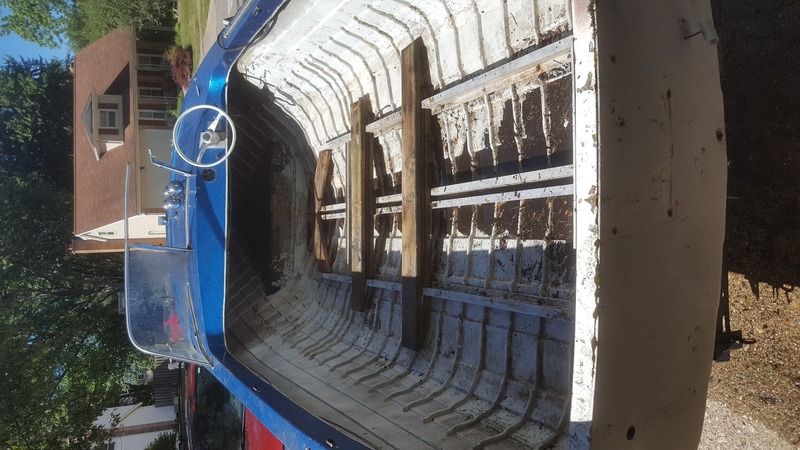 In 1962, they switched to a fiber-glassed in floor with fiberglass stringers, rather than the aluminum stringers and the little glued-on fiberglass ribs. The Westfield, when introduced in 1961, had the fiberglass floor and stringers from the beginning. You can always measure the length of your boat to know for sure what you have. If 16' 6", then it's an Edinboro. If 15' 8", then it's a Westfield. You may have a 1960, as most MFG models had a glove box in the center of the dash in 1961. Looks like an Edinboro to me. The first issue to tackle is the transom. If you don't have a solid transom to mount the outboard motor, you don't have a boat. Using a poured transom material is best, like Seacast or Corbon-Core CarbonBond. I used the latter for my 1962 Edinboro while my brother used Seacast for his 1965 Edinboro. Both work, but the cost of the material is the least of your concerns. From your picture, there is a lot of fiberglass work to be done on the skins before a transom can be poured, along with a ton of work cleaning out the old wood in the transom. 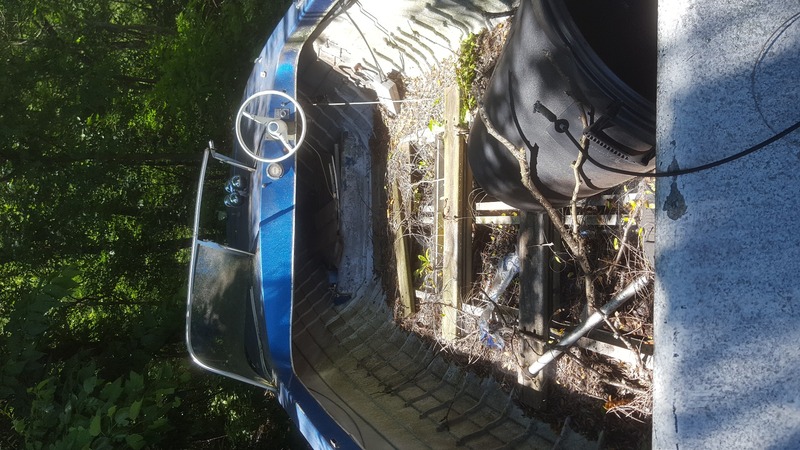 Mine was so bad is was not even like mulch - more like peat moss, with major damage to the fiberglass due to the motor hanging off this severely weakened transom. I decided to have it professionally done. It was much more expensive, but it was done right and even had them re-gelcoat the transom on the outside and repaint with hand dabbed splatter paint on the inside. Overkill, I know, but it's what I wanted. One piece of good news is that on models with the fiberglass floor, water often infiltrates between the floor and the hull through the holes in the well nuts that hold the seats to the floor. On yours, the hull is open and can be cleaned out and a new floor installed. Also, in a fiberglass floor model, there is foam flotation under the floor than can get water-saturated and add a lot of weight to the boat. I would recommend cutting out the interior skin, leaving a 2-3 inch tab all around, fixing all the fiberglass skins, then re-fiberglassing the inner skin to the tab. 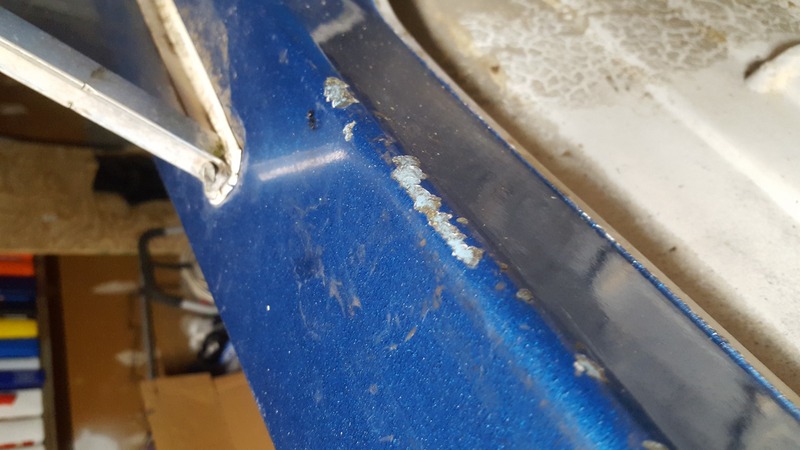 To get the curve just right, we found a particular deck rib from a 26' Lyman perfectly matched the curve of the Edinboro transom, and used that as a form to get that proper curve. My floor did not need work, other than filling a hold the was inexplicably drilled into it The keel and hull had a total of four small holes in them, the windshield was bent, the white deck hardware needed stripping and powder-coated with semi-gloss white. The deck was pink from oxidation and took nine steps to bring it back. 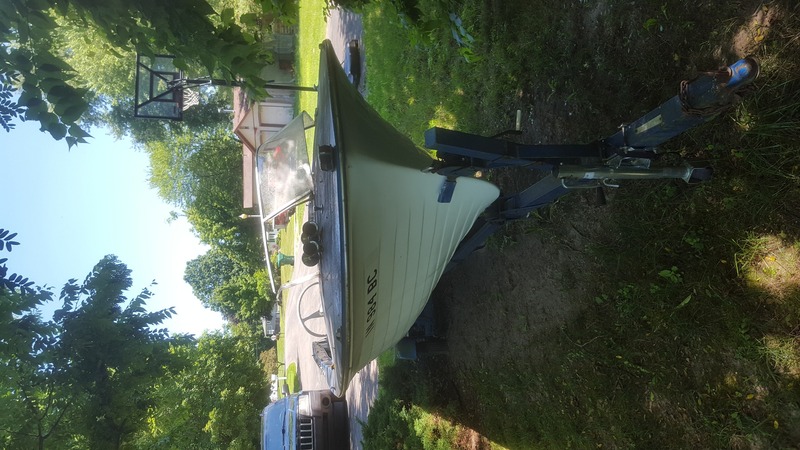 The seat boxes needed work, I ended up getting a new trailer, and I put significant effort and money into getting the 1984 Evinrude running right. Bottom line, it took almost two years, and a lot of money to get it back to looking like the attached picture. The seats upholstery is original - I got lucky there. The attached picture shows how it looks now - about 95% done, but very usable. 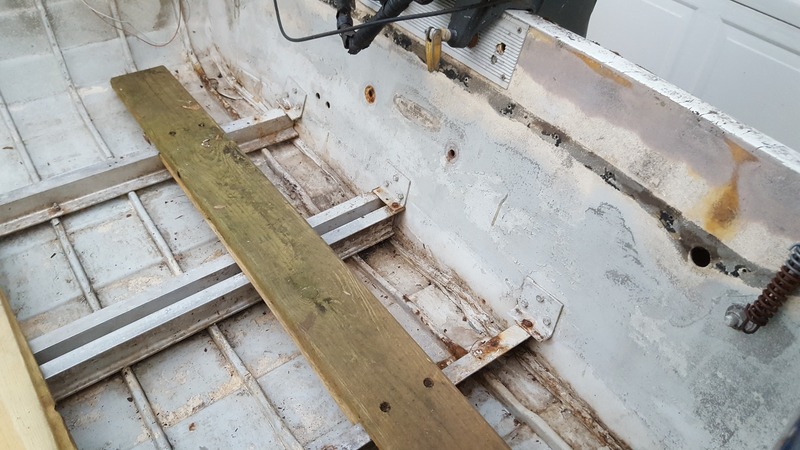 I've been reading a "runabout restoration" book and it's been recommended several times to do the floor first, hence my concern with cost before I've tackled that transom. It's 65% ants, 20% moss, 15% water in there.. So I know that's a big job. So in my measuring of the floor, I've also been comparing those numbers against the chart on the site. I think I may actually have a 1962 based on the transom width. It's definitely not 80" - and if I measure the outside width (hoping that's correct) I get 66" which looks to be a 1962. How is beam length measured? I'd like to be sure on the year and model. I also am curious on the color. Was this sparkly blue gel coat original? There's a few significant chips in one spot and it's a light robin's egg color under there. Is that a primer or base, or the original color? Last question for the night.. Would there have been side panels originally? Thanks again for your time and advice!! I would do the transom first. You have to have a solid transom to mount an outboard. I would not use wood. Why use something that will just rot again? You have a 1959-1961. Definitely not a 1962. The beam is measured at the widest point of the width of the boat. The transom width is almost always smaller than the beam. Your boat deck was painted at some point. MFG did not use any metal-flake or other metallic gel coats, and the fact there are layers shows it was perhaps painted several times. It looks like your deck was maybe a light blue from the factory. MFG did not use paint, but only gel coat at that time. There is no base other than resin and fiberglass cloth. There were no side panels. My 1962 has no panels, either, with ski racks and storage cubbies introduced with 1963 models. Thank you, SO MUCH. you single handedly answered so many of my questions! I've been researching with little success for weeks! I do have the serial and model number from the transom sticker and aluminum stringer stamp. Anywhere those can be used to identify my boat versus others? It hadn't been registered since 1990 so the history of it may prove helpful at the DMV too..
Would this have been a single set of back to back seats d'ya think? The Edinboro used one bench-type front seat, with backs, with a second seat like it as an option from 1959-1961. It used Sun 'n Fun seats, an MFG exclusive design, from 1962-1966. The first year for regular back to back seats was 1967. If you can, post pictures of whatever serial number and model tags you have and we'll see what we can do to help. Okay, so I got a little spooked and stepped away from the boat for far too long! I threw in a quick floor to walk around inside, get measurements etc, without damaging the hull by putting too much weight in any one spot. I'm "ready" to rip into the transom now, but am still unsure best way to go. Someone mentioned the skins were in need of lots of work a few posts back...so I was wondering what I missed? I was ready to duct tape the holes and dump some compound. If there is fiberglass to do, I might as well cut the inner skin and just do wood layups and save some money. SeaCast is well reviewed, but I also read a forum on here somewhere with some great results from Carbon-Core. Amazon now lists Arjay too. Any thoughts? I need 7-8gallons and really dont like the price structure for SeaCast. The Carbon Core only comes in 5gal buckets, but they are $189ea plus $10 catalyst ea so I come out $100 ahead. Just an aside. My boss, Lysle Gray, at Coast Guard HQ in the 80's, was chief engineering at MFG in the 60's. Nice to see his boats outlived him.